Archibald MacLeish was born in Glencoe, Illinois, on 7th May 1892. After graduating from Yale University in 1915 and two years later his first book of poems, Tower of Ivory, was published. MacLeish he joined the United States Army in 1917. He served in France as a field artillery officer during the First World War and during the summer of 1918 took part in the2nd Battle of the Marne. On his return to the United States MacLeish resumed his studies and received a law degree from Harvard Law School in 1919 and became a lawyer in Boston. In 1923 MacLeish gave up his legal career and decided to tour Europe. During this period he published several books of poetry including The Happy Marriage (1924), The Pot of Earth (1925), Streets in the Moon (1926), The Hamlet of A. MacLeish (1928) and New Found Land(1930). He also wrote two plays, Nobodaddy and Panic which dealt with the Wall Street Crash. MacLeish worked as editor of Fortune Magazine (1929-1938) but continued to write poetry.Conquistador (1932) won the Pulitzer Prize and His Frescoes for Mr. Rockefeller's City (1933) was described by one critic as campaign poetry for Franklin D. Roosevelt and the New Deal. MacLeish also joined the League for Independent Political Action. The group, that included Lewis Mumford and John Dewey, promoted alternatives to a capitalist system they considered to be obsolete and cruel. In August 1936 MacLeish wrote an article for New Masses where he urged the United States government to support the republicans in the Spanish Civil War. Along with John Dos Passos, Lillian Hellman and Ernest Hemingway, MacLeish helped to finance The Spanish Earth, a documentary film about the war. MacLeish came into conflict with Henry Luce, the owner of Fortune Magazine, and Laird Goldsborough, the foreign affairs editor of Time Magazine, also part of the Luce's growing media empire. George Teeple Eggleston, who worked for the company at the time, has claimed that it was Goldsborough who persuaded Luce to support General Francisco Franco during the Spanish Civil War. According to Eggleston: "Time's conservative foreign news editor, Laird Goldsborough, promptly slanted all news stories in his department in favor of General Franco's rebel insurgents." Eggleston argued that MacLeish "promptly bombarded Luce memos denouncing Franco's coalition of landowners, the Church, and the army". Goldsborough responded by arguing: "On the side of Franco are men of property, men of God, and men of the sword. What positions do you suppose these sorts of men occupy in the minds of 700,000 readers of Time? ... They resent communists, anarchists, and political gangsters - those so-called Spanish Republicans." 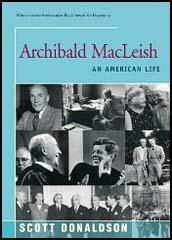 MacLeish also joined other left-wing writers in the League of American Writers. Other members included Erskine Caldwell, Upton Sinclair, Malcolm Cowley, Clifford Odets, Langston Hughes, Carl Sandburg, Carl Van Doren, David Ogden Stewart, John Dos Passos, Lillian Hellman and Dashiell Hammett. MacLeish wrote at the time: "The real struggle of our time was not between communism and fascism but the much more fundamental struggle between democratic institutions on the one side and all forms of dictatorship, whatever the dictator's label, on the other." MacLeish took a keen interest in world affairs and The Fall of the City (1937), a radio play about the growth of fascism in Europe, obtained a large audience in the United States. In April 1938 MacLeish published Land of the Free. The book included 338 lines of a poem by MacLeish and 88 photographs by Dorothea Lange, Walker Evans, Arthur Rothstein and Ben Shahn. Most of the photographs came from the Farm Security Administration project and dealt with issues such as rural poverty and child labour. In 1939 President Franklin D. Roosevelt decided to appoint MacLeish as librarian of Congress. Right-wing politicians objected to this proposal and J. Parnell Thomas a member of the House of Un-American Activities, argued that MacLeish was a communist. MacLeish, who had been a harsh critic of the American Communist Party for many years, replied "no one would be more shocked to learn I am a Communist than the Communists themselves." When the vote was taken in the Senate, sixty-three voted for MacLeish (eight voted against and twenty-five abstained) and he was appointed. During the Second World War MacLeish wrote for the New Republic. He was also head of the Office of Facts and Figures. This brought him into conflict with J. Edgar Hoover, who tried to stop him employing left-wing figures such as Malcolm Cowley. Hoover complained that Cowley had been "associated with various Liberal and Communist groups." In January 1942, MacLeish replied that the FBI agents needed a course of instruction in history. "Don't you think it would be a good thing if all investigators could be made to understand that Liberalism is not only not a crime but actually the attitude of the President of the United States and the greater part of his Administration?" MacLeish was unaware that he was also under investigation by Hoover and the FBI. The agency was particularly interested in his involvement with the League of American Writers and other anti-fascist groups in the United States and his pro-Russian stance after the bombing of Pearl Harbor. MacLeish's FBI file eventually ran to six hundred pages, longer than any other writer in the United States. In November 1944 Franklin D. Roosevelt appointed MacLeish as his assistant secretary of state for cultural and public affairs. Once again right-wing members of the Senate complained about the appointment of MacLeish. The vote was close with forty-three in favour, twenty-five against, and twenty-eight abstaining. MacLeish's main task was to promote the idea of the United Nations to the American people. However, the job only lasted a few months as Harry S. Truman decided not to reappoint him after the death of Roosevelt on 12th April 1945. In October 1952 Joseph McCarthy claimed that MacLeish had belonged to more Communist front organizations than any man he had investigated. Despite coming under increasing pressure, MacLeish bravely defended his left-wing friends during the McCarthyism era. A play about the irrational fear of communism, The Trojan Horse, appeared in 1952. MacLeish was appointed professor of rhetoric and oratory at Harvard University in 1949. 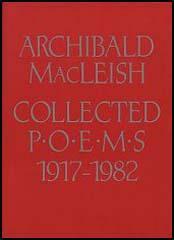 Other books by MacLeish include Poetry and Journalism (1958), Poetry and Experience (1961), The Collected Poetry of Archibald MacLeish (1963), The Dialogues of Archibald MacLeish and Mark Van Doren (1964), The Wild Old Wicked Man and Other Poems (1968), The Human Season (1972) and Riders on the Earth (1978). Archibald MacLeish died in Boston on 20th April, 1982. (1) In 1933 Archibald MacLeish explained the background to the poems His Frescoes for Mr. Rockefeller's City. Here in America, to me an American now living here, there is this fact: a great continent, a great section of the earth until a dozen generations ago unknown has been discovered, changed, overrun, and at last completely subjugated. The railroads have been built and the farms fenced and the banks have strung their spider webs over the whole face of the land. But this is the wrong relation of man and earth - exploitation - promotion - Mr. Hoover. This poem then is the poem of the relation between man and the earth worked out by satire and by praise and it celebrates always the true: it satirizes the false: it uses the actual names of actual men and the actual events of actual history: it imagines a true and actual civilization instead of the false and sour communism or the hoggish capitalism. The real struggle of our time was not between communism and fascism but the much more fundamental struggle between democratic institutions on the one side and all forms of dictatorship, whatever the dictator's label, on the other. (3) In an attempt to get Archibald MacLeish appointed as librarian of Congress, Dean Acheson wrote a letter to George L. Radcliffe, a member of the Senate Committee on the Library on 24th June 1939. At the Law School he was a leader both scholastically and in the intellectual life of the School. He had in those days, as he has now, the gift of friendship, and there are few who can spend a half hour with him without catching the fire of his enthusiasm and wanting to go with him on whatever task he has in hand. His courage has been shown on the football field, as an officer in the Field Artillery during the World War, and by his willingness to stand for the right as he has seen it against any opposition. (4) Archibald MacLeish, letter to J. Edgar Hoover concerning attempts by the FBI to get Malcolm Cowley sacked from the Office of Facts and Figures (January 1942). Don't you think it would be a good thing if all investigators could be made to understand that Liberalism is not only not a crime but actually the attitude of the President of the United States and the greater part of his Administration? Shouldn't the agents be told that the people we are at war with now are the same people who supported Franco in the Spanish civil war?" It has pleased God in His infinite wisdom to take from us the immortal spirit of Franklin Delano Roosevelt, the 3rd president of the United States. The leader of his people in a great war, he lived to see the assurance of the victory but not to share it. He lived to see the first foundations of the free and peaceful world to which his life was dedicated, but not to enter on that world himself. His fellow countrymen will sorely miss his fortitude and faith and courage in the time to come. The peoples of the earth who love the ways of freedom and of hope will mourn for him. But though his voice is silent, his courage is not spent, his faith is not extinguished. The courage of great men outlives them to become the courage of their people and the peoples of the world. It lives beyond them and upholds their purposes and brings their hopes to pass.